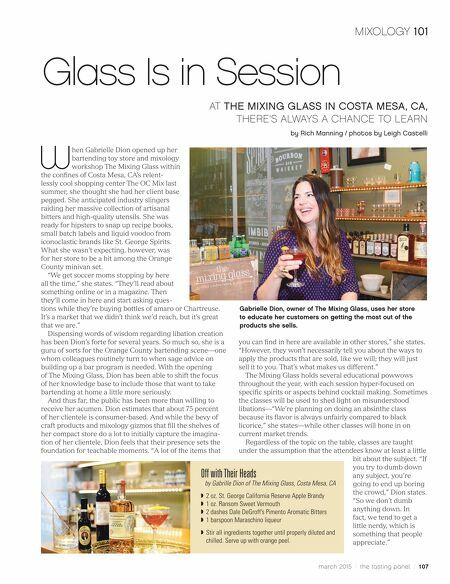 march 2015 / the tasting panel / 107 W hen Gabrielle Dion opened up her bartending toy store and mixology workshop The Mixing Glass within the confines of Costa Mesa, CA's relent- lessly cool shopping center The OC Mix last summer, she thought she had her client base pegged. She anticipated industry slingers raiding her massive collection of artisanal bitters and high-quality utensils. She was ready for hipsters to snap up recipe books, small batch labels and liquid voodoo from iconoclastic brands like St. George Spirits. What she wasn't expecting, however, was for her store to be a hit among the Orange County minivan set. "We get soccer moms stopping by here all the time," she states. "They'll read about something online or in a magazine. Then they'll come in here and start asking ques- tions while they're buying bottles of amaro or Chartreuse. It's a market that we didn't think we'd reach, but it's great that we are." Dispensing words of wisdom regarding libation creation has been Dion's forte for several years. So much so, she is a guru of sorts for the Orange County bartending scene—one whom colleagues routinely turn to when sage advice on building up a bar program is needed. With the opening of The Mixing Glass, Dion has been able to shift the focus of her knowledge base to include those that want to take bartending at home a little more seriously. And thus far, the public has been more than willing to receive her acumen. Dion estimates that about 75 percent of her clientele is consumer-based. And while the bevy of craft products and mixology gizmos that fill the shelves of her compact store do a lot to initially capture the imagina- tion of her clientele, Dion feels that their presence sets the foundation for teachable moments. "A lot of the items that you can find in here are available in other stores," she states. "However, they won't necessarily tell you about the ways to apply the products that are sold, like we will; they will just sell it to you. That's what makes us different." The Mixing Glass holds several educational powwows throughout the year, with each session hyper-focused on specific spirits or aspects behind cocktail making. Sometimes the classes will be used to shed light on misunderstood libations—"We're planning on doing an absinthe class because its flavor is always unfairly compared to black licorice," she states—while other classes will hone in on current market trends. Regardless of the topic on the table, classes are taught under the assumption that the attendees know at least a little bit about the subject. "If you try to dumb down any subject, you're going to end up boring the crowd," Dion states. "So we don't dumb anything down. In fact, we tend to get a little nerdy, which is something that people appreciate." MIXOLOGY 101 Glass Is in Session AT THE MIXING GLASS IN COSTA MESA, CA, THERE'S ALWAYS A CHANCE TO LEARN by Rich Manning / photos by Leigh Castelli Off with Their Heads by Gabrille Dion of The Mixing Glass, Costa Mesa, CA ◗ 2 oz. St. George California Reserve Apple Brandy ◗ 1 oz. Ransom Sweet Vermouth ◗ 2 dashes Dale DeGroff's Pimento Aromatic Bitters ◗ 1 barspoon Maraschino liqueur ◗ Stir all ingredients together until properly diluted and chilled. Serve up with orange peel. 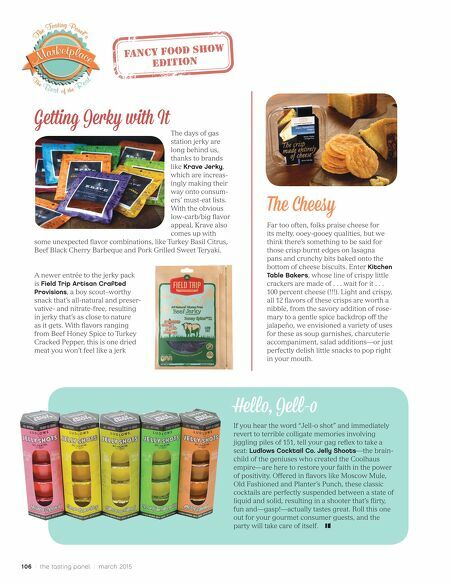 Gabrielle Dion, owner of The Mixing Glass, uses her store to educate her customers on getting the most out of the products she sells.